There is a great interest in following the German power sector. The current changes in Germany ("Die Energiewende") require special tools for the evaluation of the prospects for the next few years. PWSIM was developed for the German power system. A modified version has been used for Great Britain. The tool simulates the hourly production for up to 11 years based on a merit order list. It requires four main inputs. These are electricity gross consumption, Wind and PV output, dispatchable capacity and commodity prices. The hourly variations are based on time series for consumption, wind power and photovoltaic (PV). 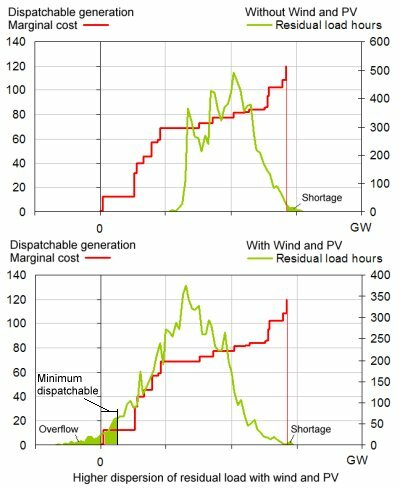 A residual load is created by subtracting wind and PV from the consumption. The residual load has a rather irregular variation which is smoothed by available pumping storage capacity. The dispatchable capacity is used for covering the resulting residual load in accordance with the merit order list. Extreme cases with electricity overflow or shortage may occur. Such cases are assumed balanced by export and import. The model does not identify or analyze congestion problems in the grid. Comprehensive analyses on the German power system have been published such as the BMU 'Lead Study 2010' (Federal Ministry for the Environment, Nature Conservation and Nuclear Safety), the BMWI 'Energy Scenarios 2011' (Federal Ministry of Economics and Technology) and the ENTSO-E System Adequacy Forecast 2012-2025. Several other studies and data sources have been used. It has been a time consuming puzzle to evaluate all these sources and to extract a consistent set of data for use in the model. The different sources reflect an increased uncertainty due to the German energy transition. The tool simulates up to 11 years between 2010 and 2050. After a simulation a large amount of data is available. Some characteristic data have been selected as standard output. For each year a mean marginal cost indicates the electricity price level. Price volatility is indicated by a standard deviation. The charts above tell a story about a power system facing new challenges. The maximum residual load is at the same level, but the result of negative loads is overflow from the power system concerned. Simultaneous overflow in interconnected countries may create negative market prices. This has been observed in Germany. Most power systems must maintain a certain minimum of dispatchable capacity connected to the grid. Reasons can be operational constraints for certain power plants (nuclear and biomass fired units) or reserve requirements to secure grid stability. It is possible to specify a minimum dispatchable capacity in the model. The overflow will increase correspondingly. Other charts are capacity factors, duration curves and a detailed output hour by hour for a selected day. Due to the data uncertainty there are very good reasons for observing the development in Germany in the next few years. The observations can be used for regular data adjustments. The model itself has interesting potentials for improvements and extensions which will be considered as needed.